Welcome to Iolani! This is a property for nature lovers, romantics, and anybody looking for a quiet escape from reality. Wake up surrounded by plants and trees, and an endless blue sky. With lodging like this, why would anybody consider staying in a condo with thousands of other tourists? The Iolani Guest cottage is fabulous for a Maui Honeymoon, quiet escape, or anybody that would enjoy a quiet Maui vacation rental cottage. Iolani Estate occupies a large two acre parcel of land, sitting on the edge of Maliko Gulch. This is the lowest section of Haiku (out of the rain band) and just a couple of minutes from Hookipa Beach. Haiku is a small rural village, with a town center (Post Office, gym, bakery, pizza shop, grocery store, doctor, pharmacy, video shop etc). Be sure to stop at the cannery on West Kuiaha, for breakfast at Pauwela Cafe (they also have a fabulous Kalua turkey sandwich for lunch). Haiku offers quick access to Makawao (approx. ten minutes by car), which has a variety of great shops and several good restaurants. 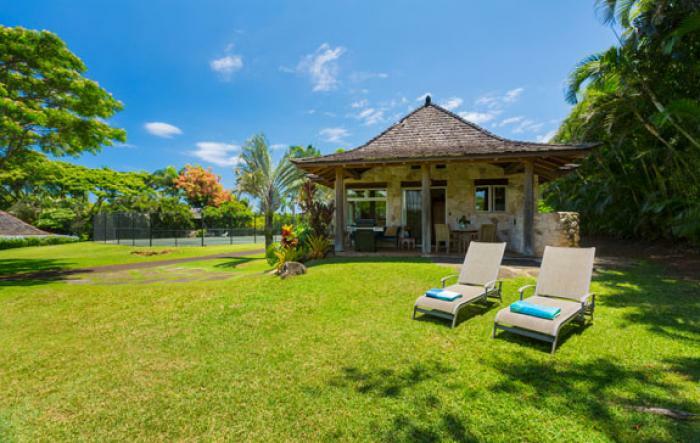 Paia is ten minutes by car.The grounds are beautifully landscaped with hundreds of trees and plants. A clay tennis court is available for guest use.It is truly a tropical oasis! The GUEST COTTAGE sits to the side of the property, with it's own garden and lawn. It has a wonderful, tropical garden view, and looks into the edge of the gulch. The cottage has coral rock exterior walls and a patio with teak outdoor dining furniture, gas grill and sun loungers. The interior has a custom kitchen (granite counters, top quality appliances including a sub-zero fridge), living area which opens to the deck, two bedrooms (king, queen), and a custom, tiled bathroom. Other amenities include telephone with answering machine, TV/VCR, DVD, stereo, laundry. This is the perfect cottage for guests wanting a reasonable price, but an upscale interior. Cleaning fee is $135, maximum occupancy (including children) is four with a minimum stay of seven nights. Must have renter’s agreement and and 25% deposit with credit card. 13.42% taxes not included.